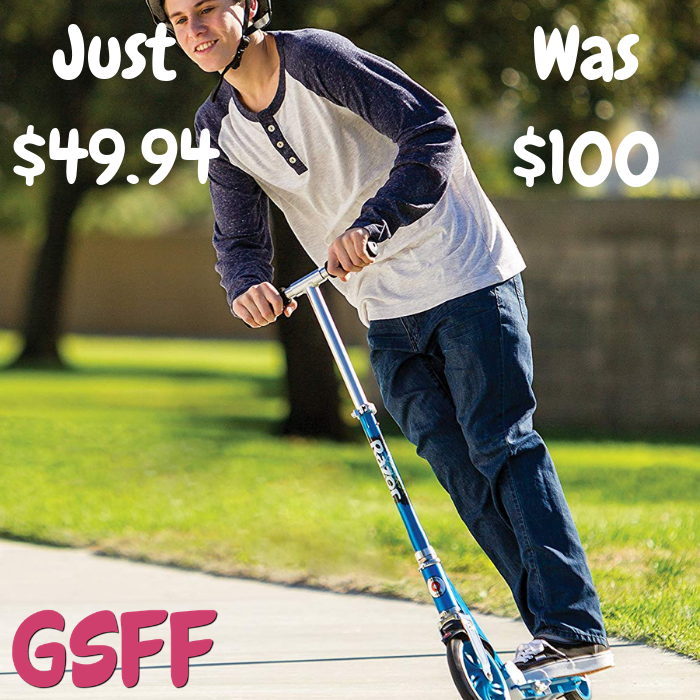 Razor Kick Scooter Just $49.94! Down From $100! Shipped! You are here: Home / Great Deals / Amazon Deals / Razor Kick Scooter Just $49.94! Down From $100! Shipped! You can score this Razor Kick Scooter which is on sale at Amazon for just $49.94 down from $99.99 PLUS FREE shipping! Are you a parent looking to cruise around with your child but don’t want to spend hundreds of dollars for something you don’t need? What you do need is this Razor A5 Lux! It is exactly like the A Model but BIGGER. The bars come taller and wider and the wheels come bigger and smoother. You’ll be having just as fun as your child! his scooter isn’t only for parents either. If you’re an older kid who is just wanting to get around town, this scooter is excellent for the job.